Our speakers are here to deliver content, that’s it. They skip the back stories and the pitches and go straight to the good stuff – the really important stuff. Stuff like what you should do with your business right now to get the kind of results that they are seeing and getting for themselves and their customers. When you attend the Startup Iceland Conference 2015, you’re going to get access to people who you couldn’t normally access. You’re going to learn about new ways of doing things. You’re going to learn about technology and information that is current and working for growing businesses now in 2015. The top minds in the startup and venture area will be attending this event and some of them will be speaking and mentoring you in person! This is a paid event reflecting the value of the content. Our experts come because you and our other audience members are so switched-on. Entrepreneur turned VC. Mentor. TEDx speaker. DJ. All the mentors, speakers and attendees are good people and they do what you do and they understand your challenges and your pressures. You’re going to get customers if you sell something, or suppliers if you buy something. If you need Venture Capital, if you need Mentors, if you need Advisors, if you need Friends in the same shoes as you, these people are all there. Attending a conference like this is something that can truly change your life for the better. It truly is an experience of a lifetime to listen to the speakers, being mentored by the mentors, making new friends who are going through the same things in business as you are and understand what you’re going through. 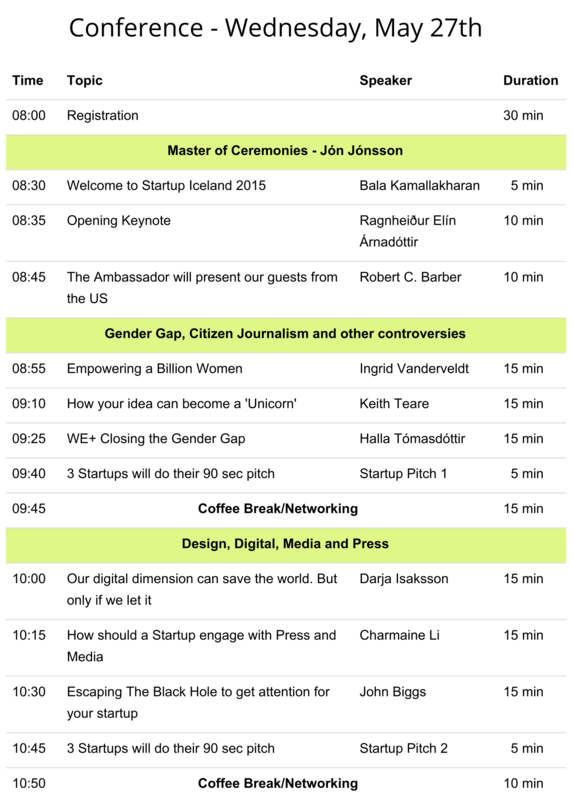 So there you go, that’s Startup Iceland Conference 2015. I hope to see you at the event, be sure to order your ticket right now. When and Where is Startup Iceland Conference 2015 happening? Startup Iceland Hackathon 2015 is on 23rd and 24th of May 2015 in Reykjavik, Iceland, in Reykjavik University. Startup Iceland Conference 2015 is on 27th of May 2015 in Reykjavik, Iceland, in Harpa conference center. Startup Iceland Mentorship 2015 is on 28th of May 2015 in Reykjavik, Iceland, in Reykjavik University. Reykjavik Iceland is a world-class destination. It has the finest food, fantastic sight-seeing expeditions whether you want to see the whales, puffins, glaciers, volcanoes or even the entrance to the Center of the Earth. You can enjoy taking a bath in the unique Blue Lagoon or go visit the golden circle. Iceland is truly a pearl of nature with an amazing value. Download a printable PDF version of the agenda. Get an experience that is not available at other places. You have the opportunity to connect with hundreds of high achieving entrepreneurs and market leaders and we make sure not to overbook. We hold these events because we think the community demands it and needs it. It’s a good thing to do, and it helps people get results with their startups. We’re all about nurturing that community. 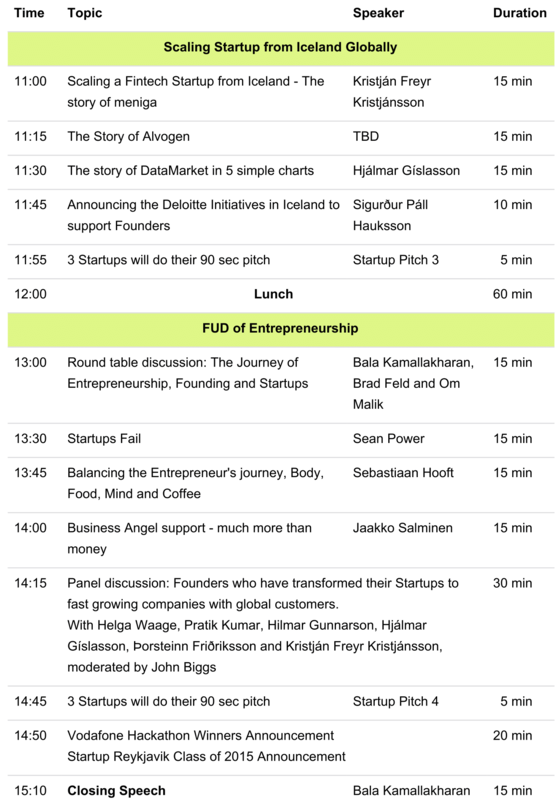 Startup Iceland Conference 2015 will be limited to only 300 people in order to make it a truly unique event where everyone gets a fair chance to network. The conference will not be overcrowded like many conferences get in order to keep the quality high. Better yet, a ticket to an event like this normally costs thousands of dollars but a ticket to Startup Iceland 2015 is way less than $1000. A total bargain AND startup-friendly especially when you consider the high-caliber speakers and mentors you have unfiltered access to. You don’t have to worry about the Startup Iceland Conference being a pitchfest. The people invited to speak and mentor have nothing to sell at the event, they’re here because we asked them to share their best stuff, and they’re going to do it as a favor to us. 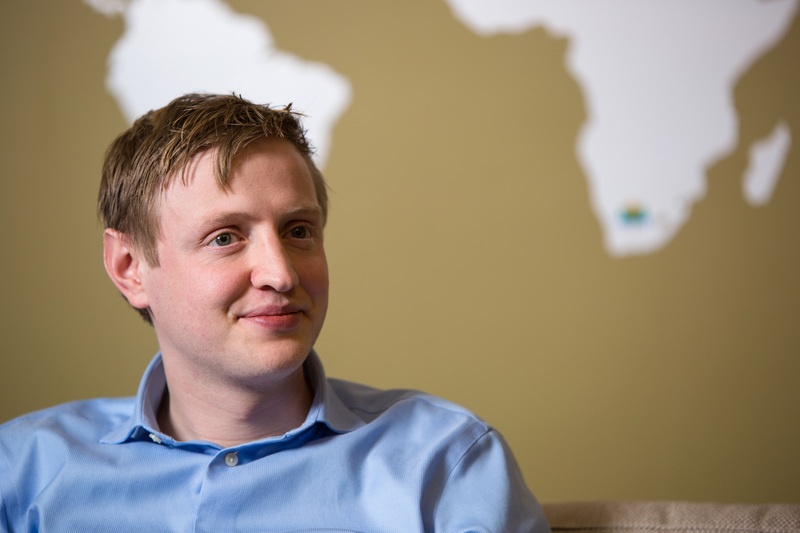 If you need to book your flight, hotel or rental car for Startup Iceland then you’re in luck. We hooked you up with the best prices for a flight, hotel room and a rental car for your Startup Iceland 2015 trip. We even pre-selected the dates for you between 22nd and 29th of May 2015. All you need to do to book your trip is click on the button below. What is the Startup Iceland Conference? It is an annual event in Iceland for Startups, Entrepreneurs and Investors hosted by Bala Kamallakharan and his team in Startup Iceland where he invites the best people in the startup and investment space all around the world to give you fresh information about startups, investments and entrepreneurship so you can get solid incredible results with your startup and investments. Past attendees had massive success implementing the simple and actionable stuff they learned from this 4 day event. This type of event is ideal for you if you are a startup entrepreneur, investor or thinking about it and you’re looking to connect with a whole lot of other people who are in the same position as you. Of the 300 people who come to an event like this, most of them have a basic understanding of what it takes to create a successful product, business or an investment. They really connect with each other. If you ever get the “loneliness” feeling because there is no-one around you who understands what you’re going through, then this is most definitely an ideal event for you. If you feel like you want to get into the right mindset and want to be all pumped up to create your own startup, then this is an event for you. It’s a very similar set of challenges that comes up over and over again so everything in Startup Iceland is directed with the objective of making things simple, of freeing up your time, of increasing your sales revenue and in turn, your profit. What results have people achieved in the past? 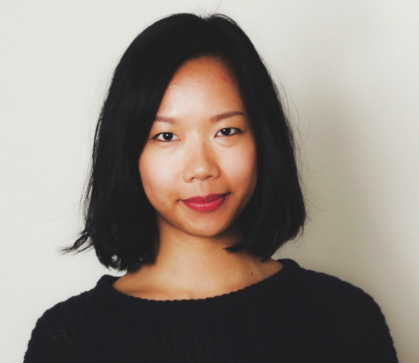 I think back to people like Pauline McCarthy, who, after pointing out what’s missing from the Icelandic tourist souvenir market at Startup Iceland, decided to do something about it herself and created a highly successful company that fills this exact need. I think that’s the success stories that I love to hear. I like to hear of people who have actually taken the idea and implemented it. You can watch Pauline and other Icelandic startups below talk about their entrepreneur stories.